La instalación se realiza en el tronco de un árbol hueco en el que se colocan electroimanes que cargados por la corriente eléctrica, producen un ”click”. El software que gestiona la reproducción de los impulsos está conectado a un sitio web que, en tiempo real, descarga las estadísticas sobre el estado de la deforestación mundial. Los datos descargados se traducen seguidamente en impulsos para ser distribuidos a los diversos electroimanes. 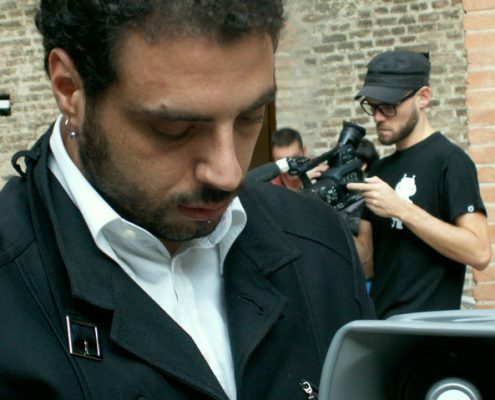 Según las estadísticas, cada “click “, producido por un electroimán representa la tala de un árbol. Esto crea un sonido denso con una textura insistente, un injerto de biomecánica que capta los ”gritos” de ayuda y establece una relación activa entre la obra y el público. Por cortesía de Studio la Città, Verona. The work stems from the desire to draw attention to the daily drama, underestimated and uncontrolled of the global deforestation which nevitably undermines the variety and biodiversity on our planet. Nature, superior and mystical intelligence, a source of life, is constantly humiliated by one of his creations, the human being who, like a tumour, attacks and destroys its own organism. Just as nature allows man to exploit it at the same time ade ​​sure that man evolving developed a conscience and sensitivity, the same quality that nature uses to defend itself.. Sometimes the human sensitivity translates into creativity and creates what it is known as art,, which has the duty and power to be witness to what happens in society, a means of communication from which a global conscience can develop. 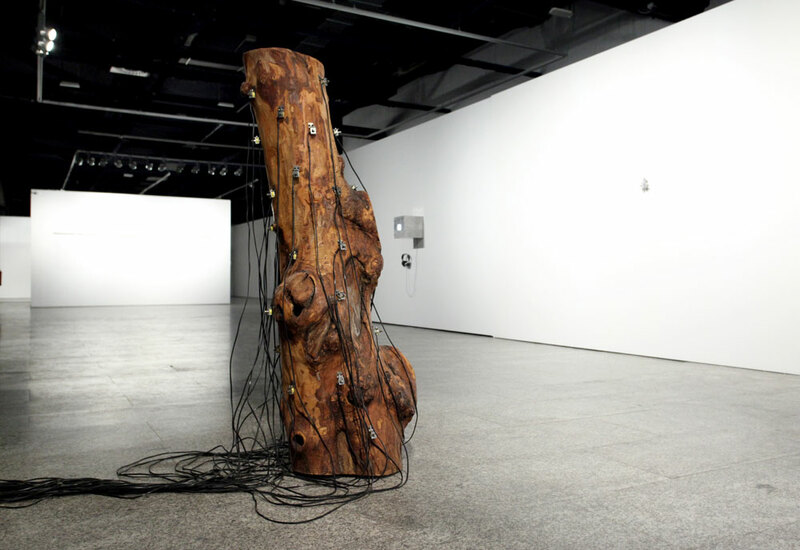 The installation is made ​​on the trunk of a hollow tree on which were set solenoids which energised by an electric current, produce a loud “click”. The software that manages the playback of the pulses is connected to a website from which, real time, statistics are downloaded on the state of global deforestation. The downloaded data is then translated into pulses to be distributed in time to the various solenoids. 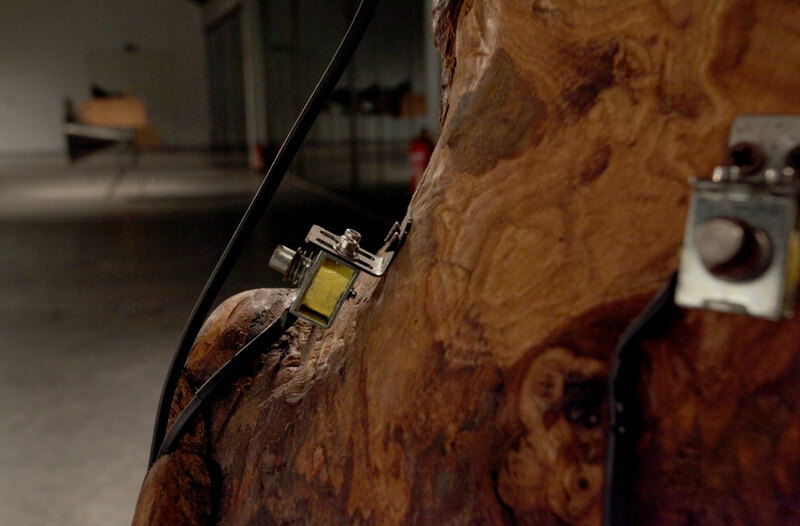 According to the statistics, every “click” produced by a solenoid represents the felling of a tree. This creates a dense, textured and insistent sound, a biomechanical graft that “screams” desperate for help and establishes an active relationship between the work and the audience. By courtesy of Studio la Città, Verona. Instalación sonora e interactiva – red de electroimanes, circuitos, cables, microcontroladores, sensores, conexión a internet. Sound and interactive installation – electromagnets, circuits, cables, microcontrollers, sensors, wireless internet.